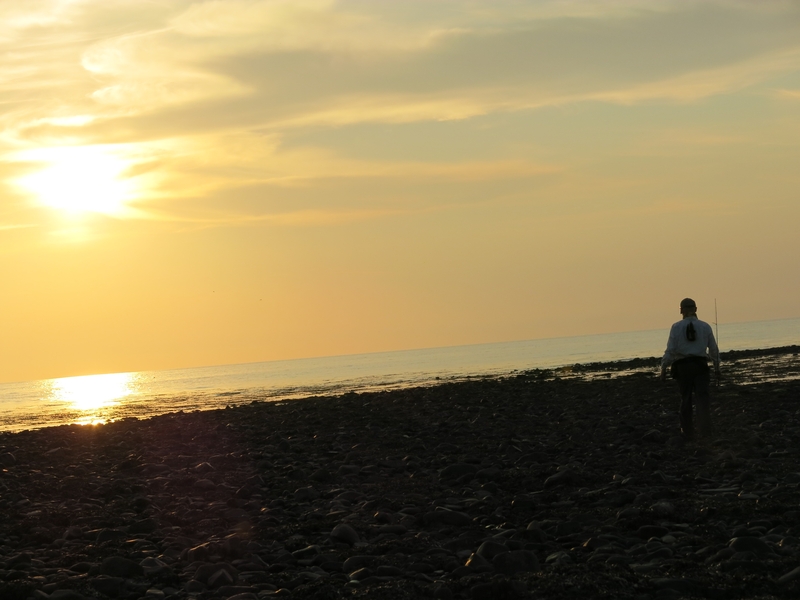 Last week was my summer holiday with Sharon in Cardigan bay. It was a great mix of tying flies outdoors, sea kayaking and fishing. 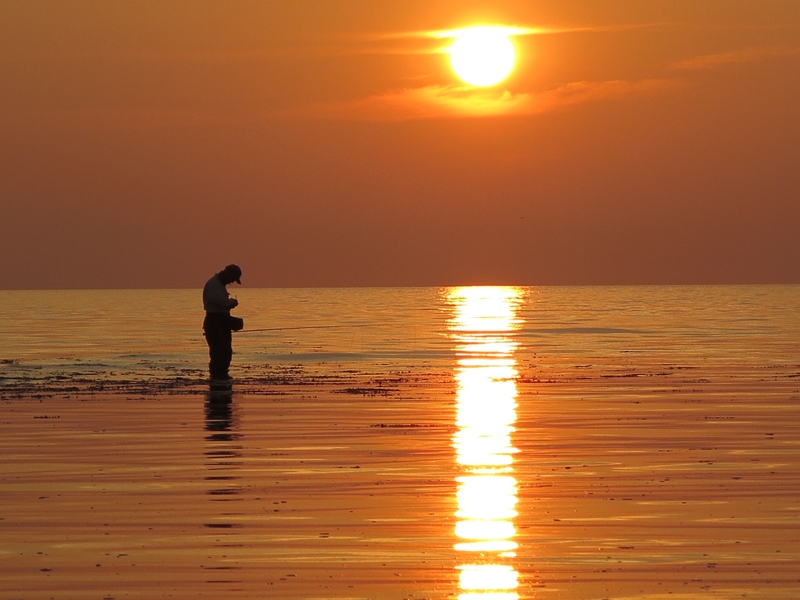 After a Saturday spent building a sandeel collection using bug bond, DNA and unique hair while listening to the ashes on the radio it was time to hit the flooding tide over the old monastery fish traps which were full of shrimps and shoals of sandeel. 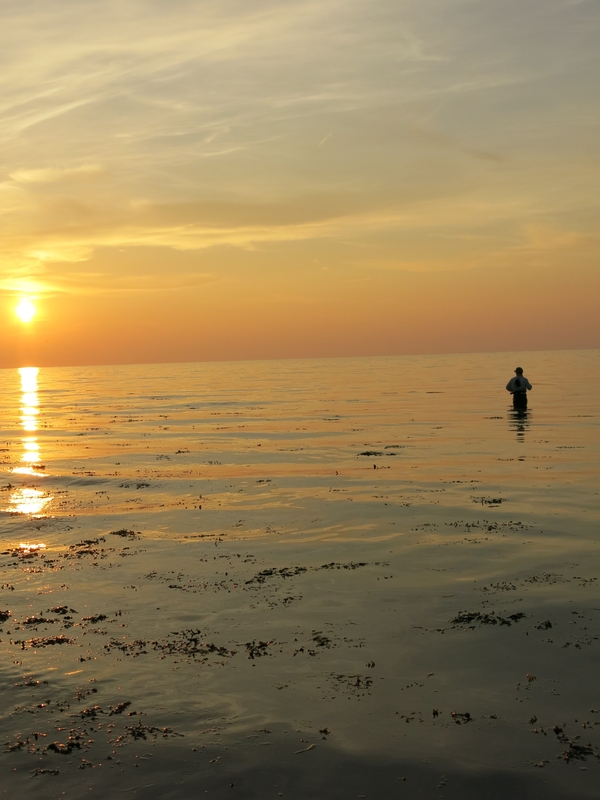 Casting as the sun dipped under the horizon I was sure I would see bass moving in on the tide. Well, maybe they were but I was foiled by the floating weed which was fouling the flies every cast. Even a crease fly and pooper couldn’t avoid the rubbish. The black gold of the sun. On the plus side Sharon got some cracking photos of me fishing against the sun. I also learned that the 6wt wulff cold saltwater line and orvis 9’6” 6wt helios could deliver a decent size crease fly without any trouble. During the week we decided to buy some sea kayaks. 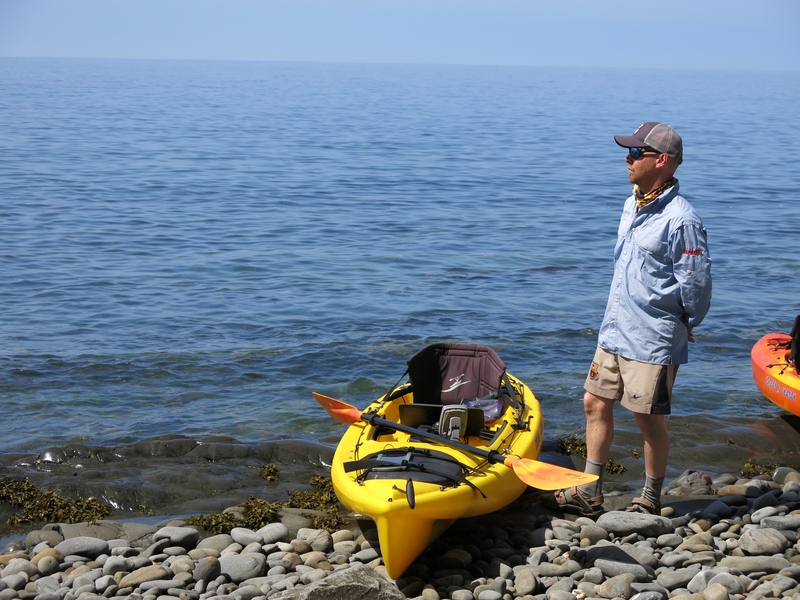 Sharon bought an ocean kayak venus 11 for trips along the coast. I bought an ocean kayak prowler big game with echo sounder. Well this really is something new to me. I hadn’t paddled a kayak since I was in the cub scouts, and I went to cry that day because my hands were cold! Sharon has paddled before and she showed me the ropes. She wouldn’t tow me to where I wanted to go, but there you go, I was pushing my luck. 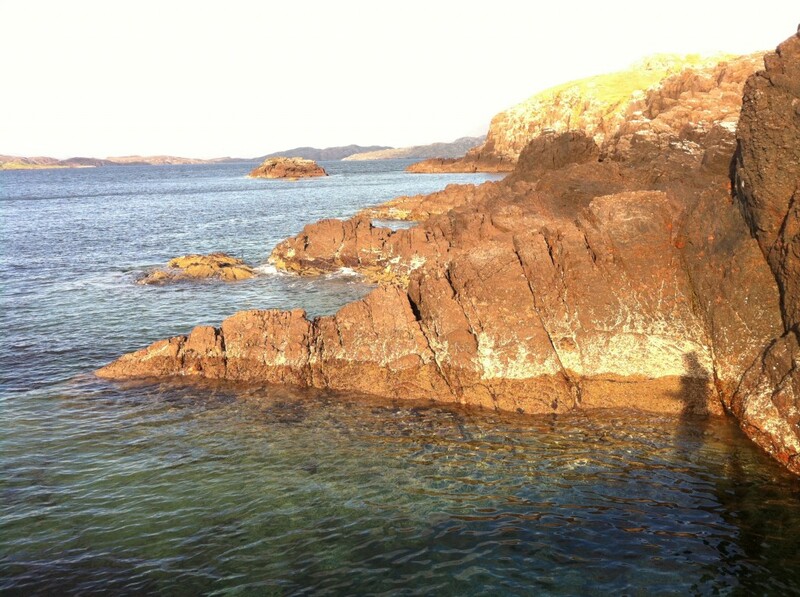 We decided to paddle to a rocky cove we had seen the day before which gets cut off from the tide. 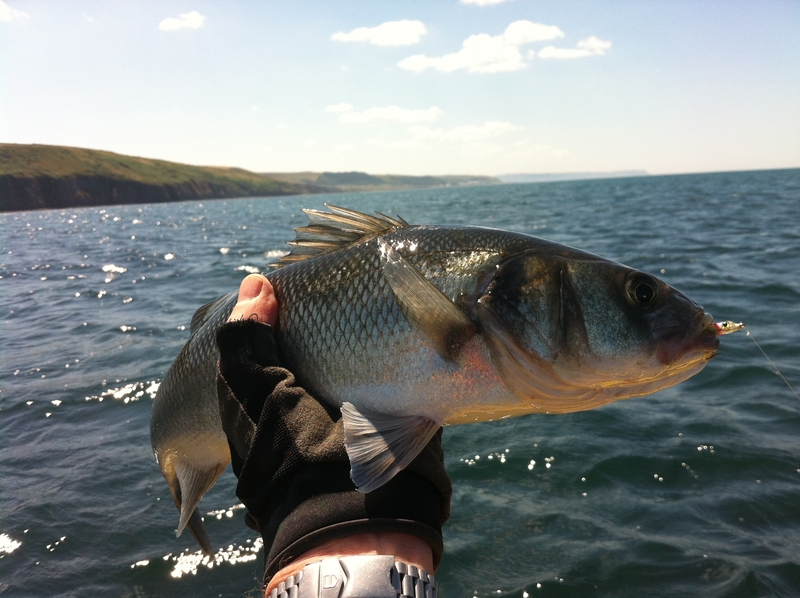 We were only over a maximum of 3m of water as the surf came in and the bass were jumping everywhere. 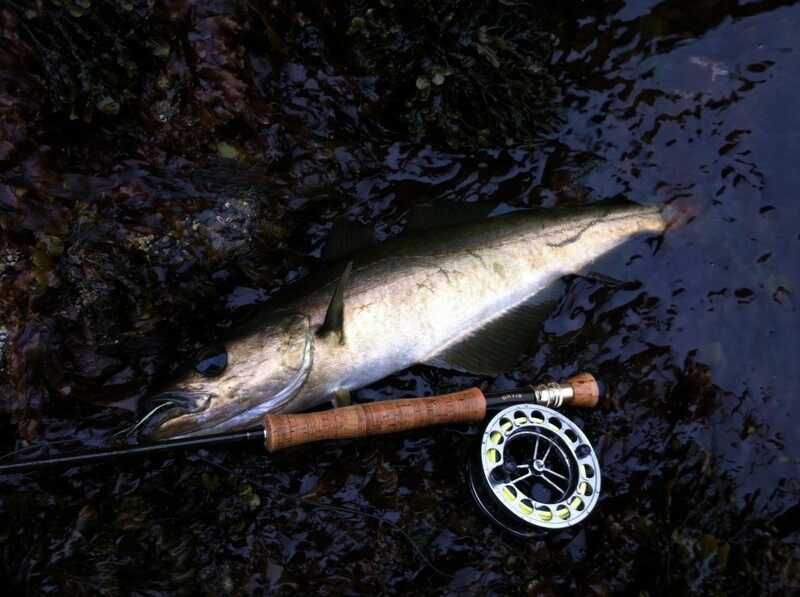 I strung up the 8wt TCX and a barrio SLX and started casting from the yak, a gurgler on the dropper with a surf candy on point as the tide flowed. Not brilliant fishing but one slash at the gurgler and another fish lost off the candy was enough to keep my interest going through the flow. Sharon still wouldn’t tow me home. Get out of my glasses Sharon. Our last day on the yaks saw me paddling to a mark I had noticed the day before. We had travelled over a reef with plenty of kelp in open water. 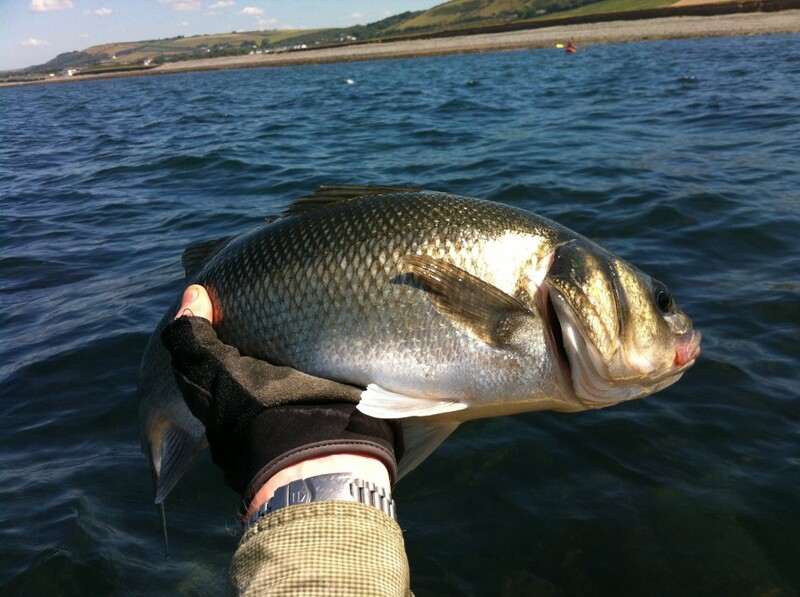 Just as I started to think kelp = fish when a huge shoal of bass buzzed under the kayak in 2m of water. I couldn’t believe it. I didn’t fish it yesterday as I hadn’t set up and I wanted to fish the cove, but here I was on the last day anchored over the same reef. I strung up with an 8wt inter rio outbound short line and TCX with 10lb tippet. On the dropper I had a DNA clouser and a surf candy on point. These were just catching the top of the kelp every couple of casts. Fists cast with the wind over the reef and I had the biggest bass of the day at 4lb on the point and a smaller fish of 2lb on the dropper, couldn’t believe it. On the first 3 hrs of the flood I caught approx 15 bass in the 1.5lb – 4lb range, all on the same flies. All from the same anchor. I decided to call it a day in the end as the swell got a little uncomfortable, not having any kayak experience I thought I better head for home in case it all ended in tears. What a great day. I will be back at this mark, there were bigger fish jumping which has wetted my appetite for the road drive involved. Its been a busy couple of weeks around the welsh coast for me this last few weeks. 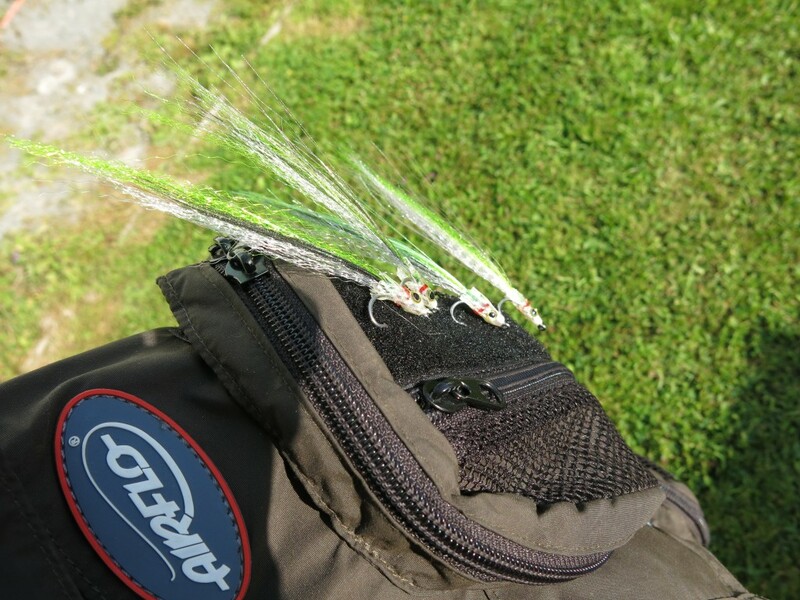 Ive taken the opportunity to get my salt flies wet while the guiding and instruction have calmed down. 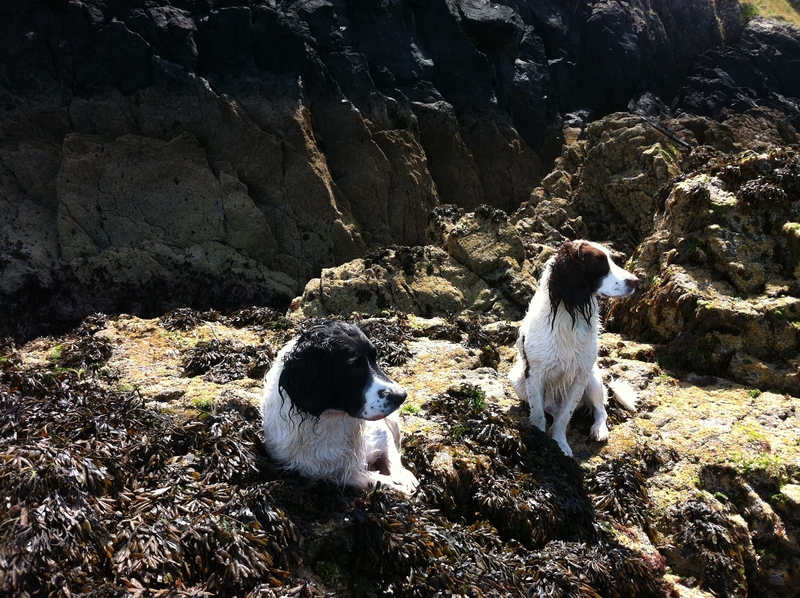 Two weeks ago Sharon and myself had a weekend camping not far from St Brides bay, Pembrokeshire. The weather couldn’t have been better, very warm with light breezes. I had my eye on a few new Pollock marks that I wanted to try. I did a rekey of a few new marks a few weeks ago on a stroll around the coastal path. 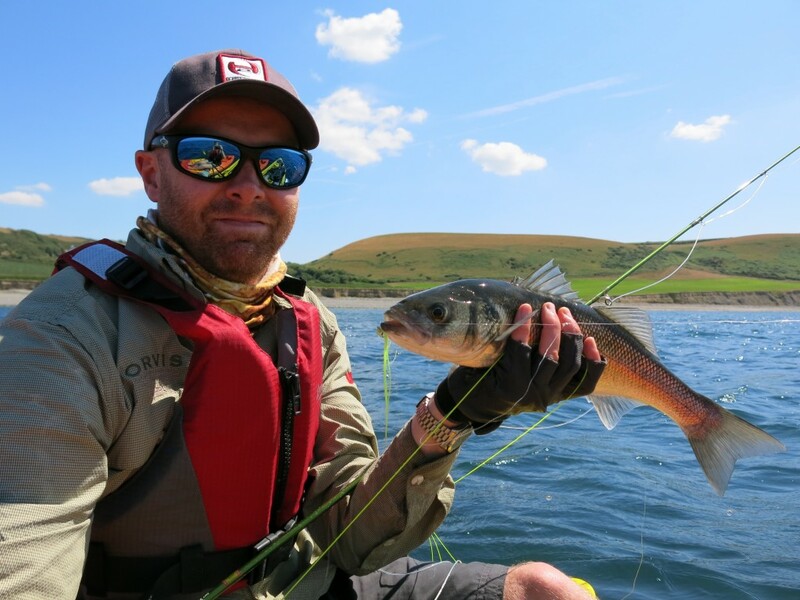 They would need a certain amount of bush wacking and rock climbing to get to but with the combination of kelp, depth and current, I thought I would be in with a shout of a welsh Pollock on the fly. The first two marks I got to looked very promising. Unfortunately both had very narrow paths leading to them so they were obviously used marks. On reaching the waters edge and kelp line I was shocked by the huge amount of angler rubbish that was laying around, mainly lure and feather packets, sandwich boxes and empty cans. I also picked some line up. What a shame in so many ways. Hopefully not seasoned sea anglers but rather the drunk mackerel bashing goons that turn up in the summer. I didn’t fish either mark, the rubbish put a bad taste in my mouth and the fact that the fish had already received angler pressure put me off. Trudging onwards the last mark I wanted to fish, on arrival it was pristine, Sharon could even watch me from the cliff. 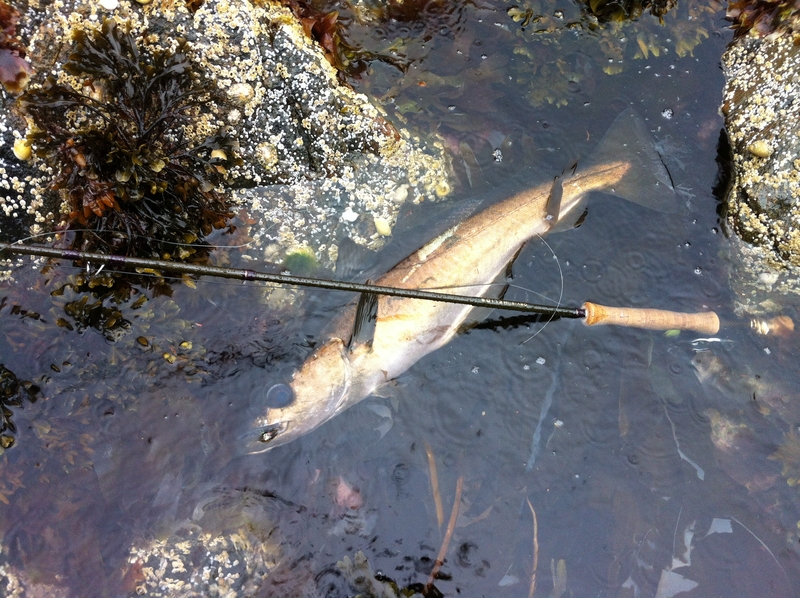 On a nice gully at the edge of a bay stuffed with kelp and a couple of lobster pots I strung up an 8wt TCX and airflo di7 sniper line. 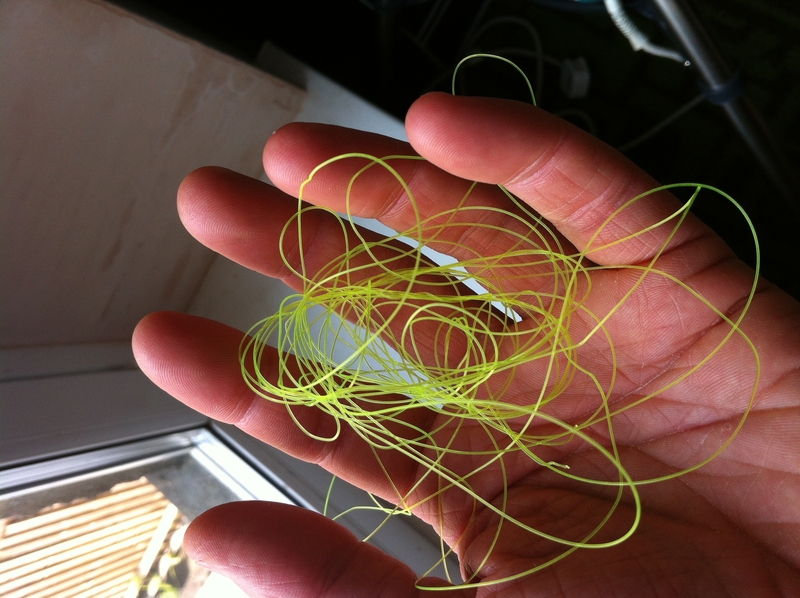 A 7inch DNA clouser with 20lb orvis mirage fluorocarbon hung of the end. I was fishing the last 2 hours of the ebb which wasn’t ideal for this mark, but I had to go home at some point! 4 pollock was the end result over 3 hrs fishing. Biggest 4lb. Very satisfied that the mark produced and it topped a really good weekend. The fish had a far lighter colour than the Scottish fish I was catching a month or so ago. I love Scotland. 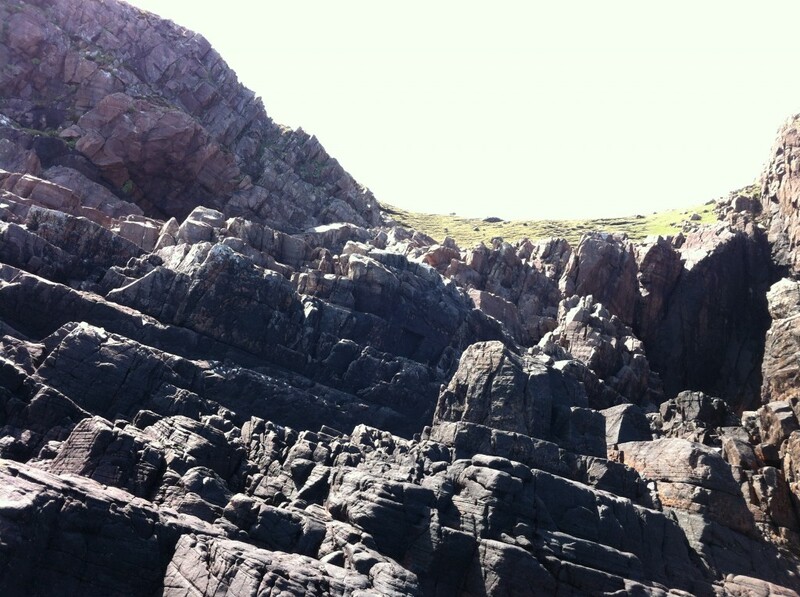 More specifically the western highlands and the pollock that knock about along its coast. Its the second year ive joined a party from aberdeenshire on their annual pilgrimage north to fish for sea trout and pollock in the salt and the brownies in the lochs. Whilst i did a bit of everything last year, this year I wanted to concentrate on the pollock and find new marks along the rocky shore. When the suns out, its spectacular. It was a case of walking the likely bays and drop offs where deep water became shallow, then making a few casts to see if anyone was at home. Luckily I didn’t have a blank day and caught some of the hardest fighting fish ive come across. The 10 weight was hooped with that tail! 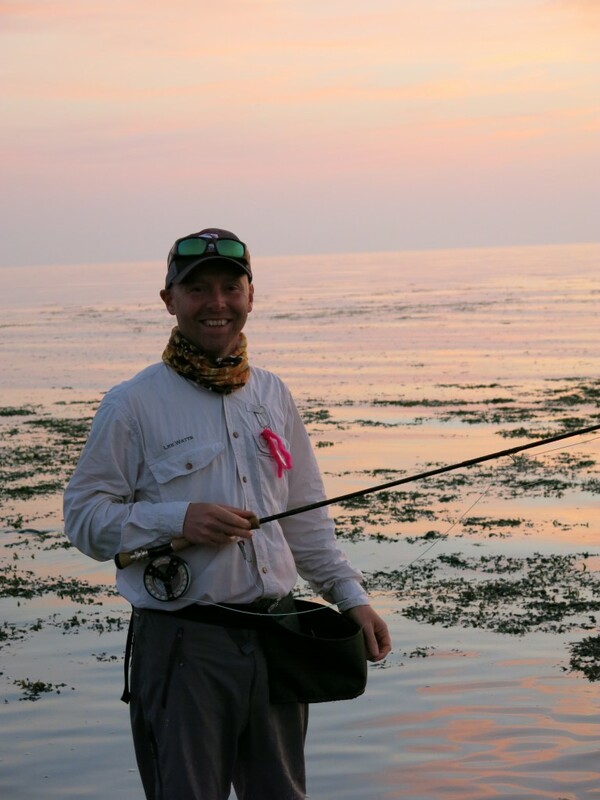 I used a 10wt orvis helios and a 8wt sage TCX loaded with airflo sniper sink type 7 lines http://www.flylines.com/airflo-fly-lines-forty-plus-sinking-forty-plus-sniper.cfm which were perfect for the job and really hard wearing on the barnacles, limpits and rocks. 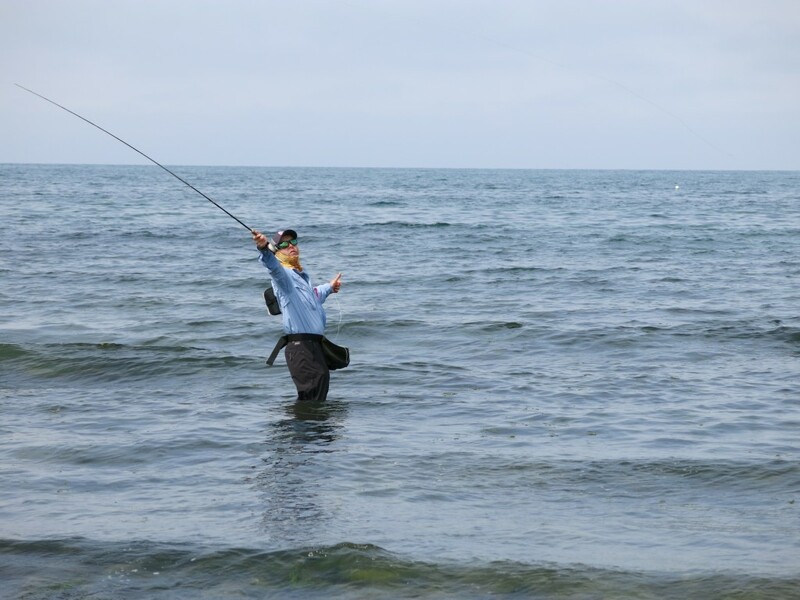 When the fish takes your sandeel pattern, you have to clamp the line tight and stop the fish from getting into the kelp, other wise its curtains. 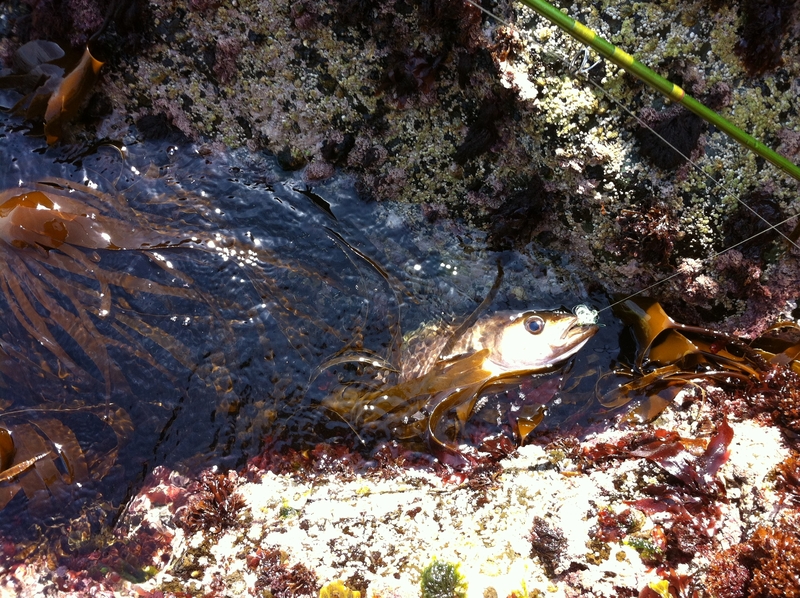 I lost one fish because it wrapped my leader around the kelp. 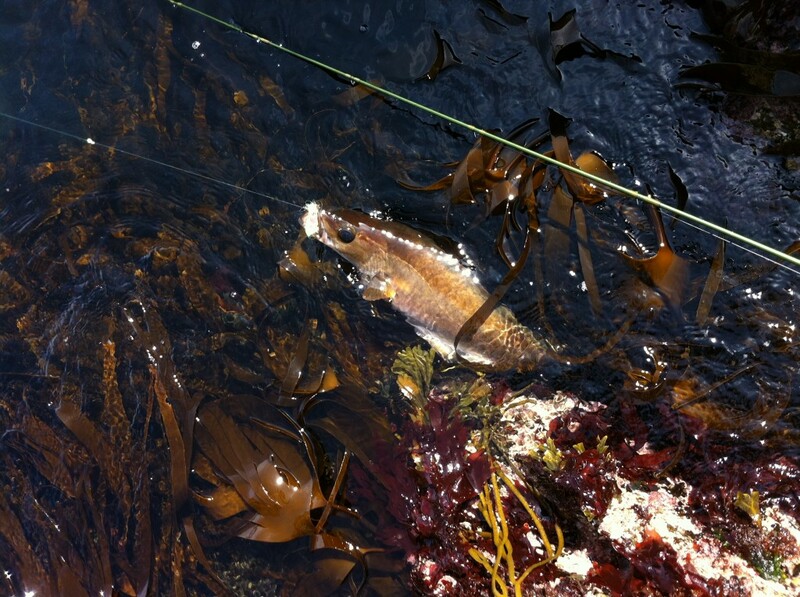 Believe me, you need heavy gear for decent size pollock over kelp beds…a drop net is handy to sometimes! 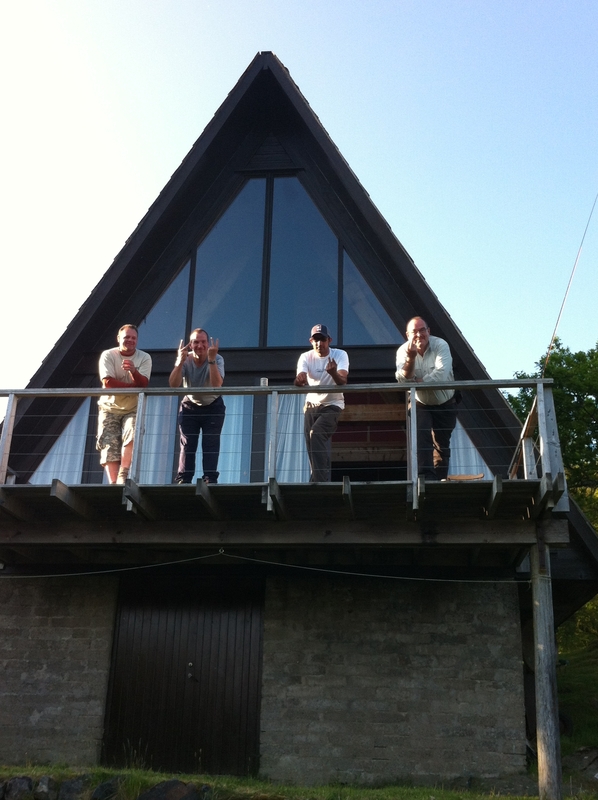 It was great to be with the guys again, they are a great bunch. 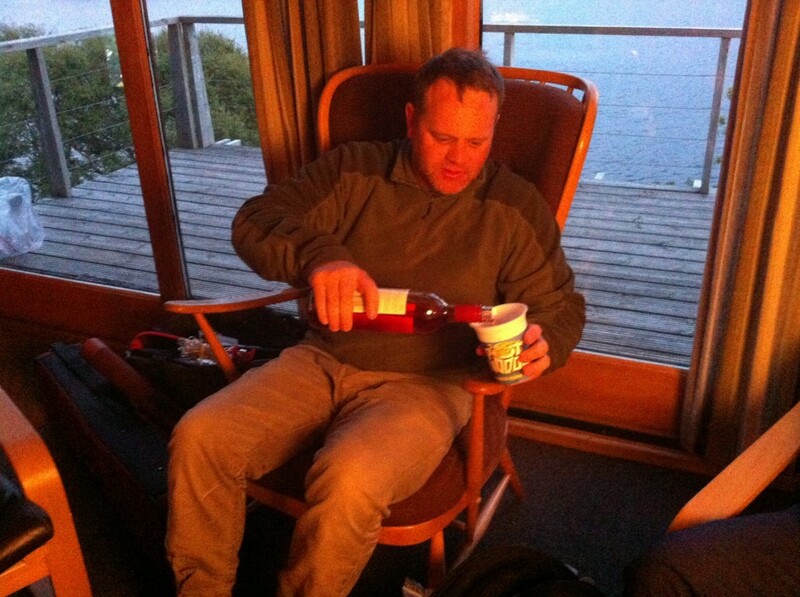 I promise to do more float tubing with them for the trout next year, but I will not drink wine from a pot noodle pot, as seems to be the aberdeenshire way.